Here in the United States, saying we like our caffeine is probably the understatement of the century. Americans consume 400 million cups of coffee per day (equivalent of 146 billion cups of coffee per year) and coffee represents 75% of all caffeine consumed in the States! That is a LOT of caffeine, friends. So when it comes to how coffee is supplied that becomes even more important with the amount of coffee being processed on a daily basis. Tea doesn't seem to have the same appeal to pop culture as coffee does but don't let that fool you because tea is the second most-consumed beverage in the world behind water! Here I've collected five quality, U.S.-based fair trade coffee and tea roasters and suppliers to ensure the best taste (and sourcing) to your caffeine cup of choice for everyday life. How they give back: DOMA coffee is certified, organic fair trade coffee and has direct relationships with coffee farmers. They are active in partnering with local and regional organizations such as Kootenai Environmental Alliance (KEA) and Protect Our Winters (POW), la bicicletta, and Spokane Riverkeeper that benefit the environment and their communities. And in their coffee roasting process, they use an eco-friendly roaster that conserves 80% more natural gas compared to traditional roasters. How they give back: Pura Vida Coffee is fair trade certified organic coffee, shade grown, with 100% Arabica beans and locally roasted then delivered just a few days after for quality, fresh coffee. These guys are passionate about supporting their coffee farmers, the environment as well as giving back. Most of Pura Vida’s net proceeds gets donated to their own 501(c)(3) public charity called the Create Good Foundation that helps support at-risk children around the world. So far, they’ve generated of $16 million that has gone back to their coffee farmers. Fun fact: Pura Vida was one of the first brands to sell fair trade coffee exclusively. How they give back: Kickapoo values the relationship with their coffee farmers so much, they travel to where their coffee is grown to spend time with the farmers and become better partners. 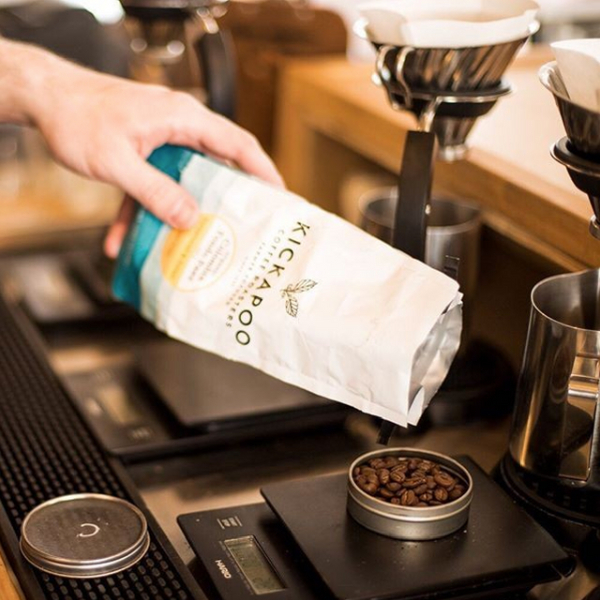 Kickapoo Coffee is a part of an organization called Cooperative Coffees that aims to bridge the gap between farmers and roasters to foster equitable trading practices and make coffee growing sustainable and beneficial for the farmer families and communities. In 2015, Kickapoo became one of the first coffee roasters to utilize power from an on-site solar array. And every year, they donate 5% of their profits to support and partner with initiatives that strengthen rural communities. How they give back: Zhena’s sells USDA organic hand-blended teas that include eco-friendly tea sachets in each package. Their teas are sourced from farmers they have relationships with and harvested by women who earn a fair wage. In their packaging process, they partner with a local organization called The Exceptional Children’s Foundation that grants opportunities to the underserved. How they give back: Rishi sells organic fair trade teas in plant-based tea bags where they foster and value the direct relationships with their farmers. This can also be called direct trade which means their buyers travel to the origin of the tea during growing season to meet the farmers and collaborate in creating new styles of tea. They are hands-on and believe in the power of building relationships. Fun fact: Rishi was one of the first importers of Fair Trade teas into the United States and remains a bulk organic Fair Trade tea importer to this day.